You'll love the new Do-it-yourself motor sludge cleaner product from Mega Power. It is faster acting, yet 100% safe, and takes 15 minutes to restore your motors running and oiling protection. Mega Power is a chemical cleaner that is an anti-wear. The secret to Mega Power's method to getting your dirty motor running right clean again is to bring in the big guns - 4 new anti-wear cleaners, and 2 special oiling, and penetrating protectors - called a sludge removing treatment. No other product has anything like Mega Power - that can tackle this type job safely. Sure, the parts stores sell engine flushes with solvents as their cleaning base, and some mechanics use detergent cleaners - but those are proving quite harmful - even destructive, rather than providing your motor the clean-up it really needs. Stay away from such products. The Mega Power cleaning method is complex, but the install is really quite easy for anyone to do, and phone help is always available - if you're timid about such car care maintenance. Your motor's sludge problem started when your motor was new, and gets worst over time. Our tips using Mega Power will revert your dirty problem back to its former, slow-forming ways. You can take apart every piston, valve, bearing, and gear and hand clean them - at about $1500 up in price. But, removing all the sludge is not needed all at once. Mega Power does so for under $100. And takes about 15 minutes. With Mega Power, you restore your motor's critical oiling - sludge plugs oil passage ways and Mega Power will open them, so your motor won't fail for that reason. That will quiet your noisy valves, end tapping, and begin power restoring. Then, Mega Power frees your motor's dirty, sticky-acting piston rings - the primary cause of your engines sludge causing problem. See our "Engine Blowby" story for details on how Mega Power does this. Shown here: The Mega Power Sludge Removing Treatment. 6 items. The silver canister and tubing is made for mechanics and quick lubes to feed one of the cleaners into the combustion area automatically. I'll have you do so without need of that $125 tool - just as easy, without it. 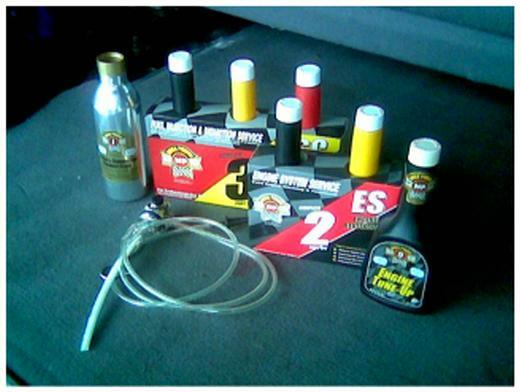 2 Step Directions for removing engine sludge. Detailed with the product. I put a number 1 thru 6, on the caps for easy usage and identity. Item #1 goes into the fuel tank. Item #2 goes into the motor's oil. Item #3 goes into the motor air intake. Drive for a week to let these product do the cleaning. Put item #4 into the motor's oil and do an oil change after ten minutes of running the motor. Put #4 in the oil at home and go to a nearby quick lube and have the dirty oil changed. Into the new oil, add items #5 and #6. drive as usual. That's it! Driving and the next oil change using Step Two again finishes the job. The motor will instantly start improving as the treatment begins. Clean and protect your motor before its to late. Why wait until only a repair is the fix. Order below. Nothing to take apart. Driving does the actual fix. To order the Mega Power Motor Sludge Remover Treatment, call me at 512 665 3388. Includes the 6 items needed for the treatment. Instructions. Phone install help, if needed. Guarantee. Price. $65+ $15s&h= $80 total. Shipped to your door in about 3 days by FedEx. Protect 2 cars. Just $125 plus $15s&H= $130 total. 12 items. Save $30. Order a Mega Power Transmission Treatment RS3 also. Protect the integrity of your transmission - and for smoother shifting, stops leaks. Includes a cleaner flush, a conditioner, and protector/problem-solver. Just: $60+ $15s&h= $75 total. Order both Engine and Transmission Treatment [9 items] for one car. Same guarantee. Just $110+$15s&h= $125 total. Save $30.